Innsbruck offers the perfect combination of mountain activities and cultural experience in the city. It has plenty of alpine charm and is very popular for visitors of all ages. Innsbruck and the surrounding holiday villages offer many sport climbing routes and multi pitches of all difficulties, all year long. There are well known via ferratas on the Nordkette and on the Martinswand in Kranebitten. Rugged rocks and steep walls provide an ideal opportunity for wonderful experiences. The Naturpark Karwendel is also a very popular climbing destination. Ehnbachklamm climbing garden: The climbing garden in the Ehnbachklamm gorge above Zirl offers 104 routes for climbers of all levels. 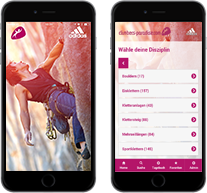 Martinswand climbing garden: The Martinswand climbing garden is an eldorado for outdoor climbers: There are numerous routes in all difficulty levels. Due to its Southern direction, you can also climb on dry winter days. There are several climbing gardens on the Martinswand, such as the Dschungelbuch, Galeria, Schleicherplatte and Grottenwegwand. Both beginners and pros will love it here! Höttinger Steinbruch climbing garden: There is hardly any climber living in Innsbruck, who hasn’t visited the Höttinger Steinbruch climbing garden at least once. It is very close to the city and offers numerous routes in easy and medium difficulty grades. The type of rock is reddish breccia. There are normally a lot of people climbing up there. Some of the most popular routes are already quite polished. Arzbergklamm climbing garden in Telfs (Weiher): At the foot of the Hohe Munde mountain, there is the Arzbergklamm climbing garden. Due to its high number of easy routes (grade 4 to 6), it is particularly recommended to beginners and slightly advanced climbers. Even though it is located very close to Telfs and the access hike is very short, the area is not overcrowded. There are all together 72 routes on limestone. Locherboden climbing garden: The small Locherboden climbing garden close to the Mieming sun plateau is well secured and offers 30 routes not harder than 5. For this reason, it is highly recommended to family with children. The short access hike and the beautiful view over the Inntal valley are two more plus points.